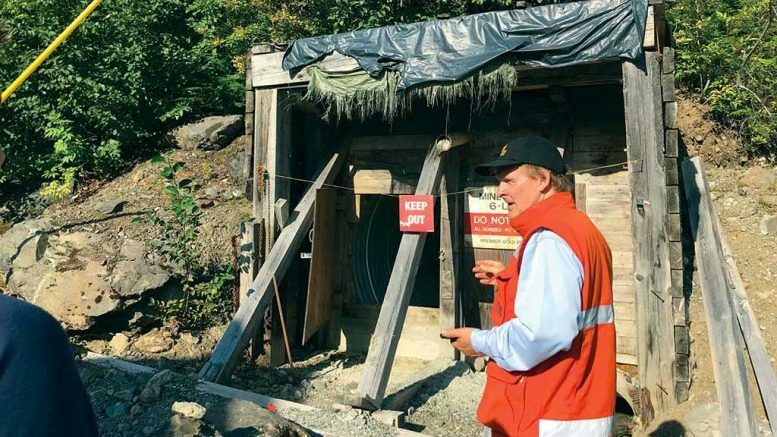 Ascot Resources’ president and CEO Derek White at the entrance to underground workings at the historic Premier mine at the Premier-Dilworth project in northwest British Columbia. Photo by Colin Desmond. STEWART, B.C. — The existing infrastructure of Ascot Resources’ (TSXV: AOT; US-OTC: AOTVF) past-producing Premier-Dilworth gold project in northwestern B.C.’s Golden Triangle region is one of its greatest assets. “Underground mine, tailings facility, power, road, mill — we have it all,” Derek White, Ascot’s president and CEO, tells The Northern Miner during a visit to the company’s flagship project in August. The infrastructure is the accumulation of the mine’s storied history, inseparable from that of the nearby town of Stewart. Situated at the head of the Portland Canal, Stewart is across the border from the town of Hyder, Alaska. Over a century after the first claims were staked, White is leading Ascot’s attempt to give the Premier mine a third go. His experience restarting past-producing mines made him a good choice for the company’s shareholders when they were looking for a CEO to help bring the Premier-Dilworth project back into production. Since taking the helm in October 2017, he has been crafting a strategy to do just that. “We’re basically trying to rebuild what Westmin had,” White says, referring to Westmin Resources’ time at the property in the 1980s and 1990s (see sidebar on Page 2). First, Ascot has drafted plans to refurbish the old mill, relying on Westmin’s own flowsheet from the 1990s. The flowsheet incorporates a carbon-in-leach circuit for gold and silver extraction, zinc cementation of precious metals and doré smelting. 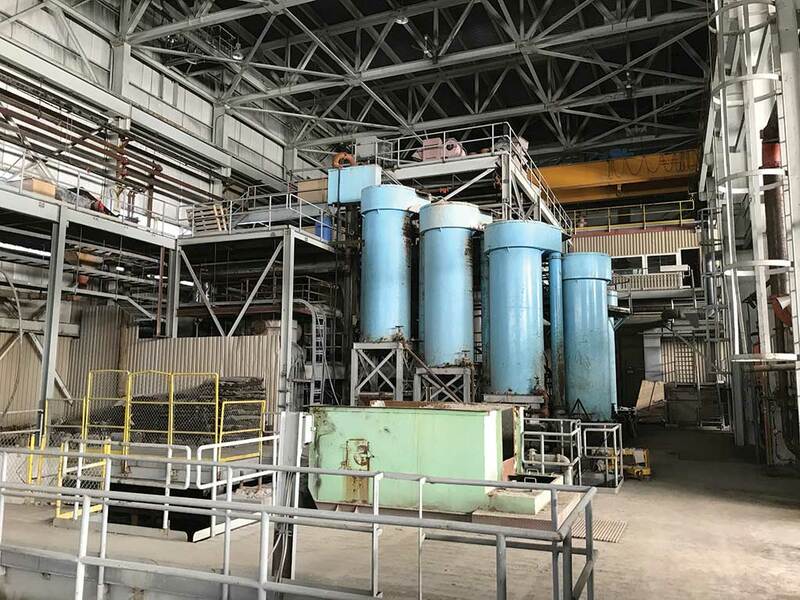 Ascot plans to import fabricated parts for the jaw crusher, semi-autogenous mill and ball mill from a producer in China, which could save millions by avoiding full replacement. With these savings, it plans on buying a Knelson concentrator and building a machine-control-centre room. White says Ascot would aim to run the refurbished mill at a rate of 2,500 to 3,000 tonnes per day. In addition to the flowsheet, Ascot has 10 years of metallurgical data from Westmin’s operations to attest to the mill’s efficiency. “No amount of metallurgical testing or studies can compare to 10 years of metallurgical data,” White says. The data reveal gold and silver recovery rates of 92% and 42%. 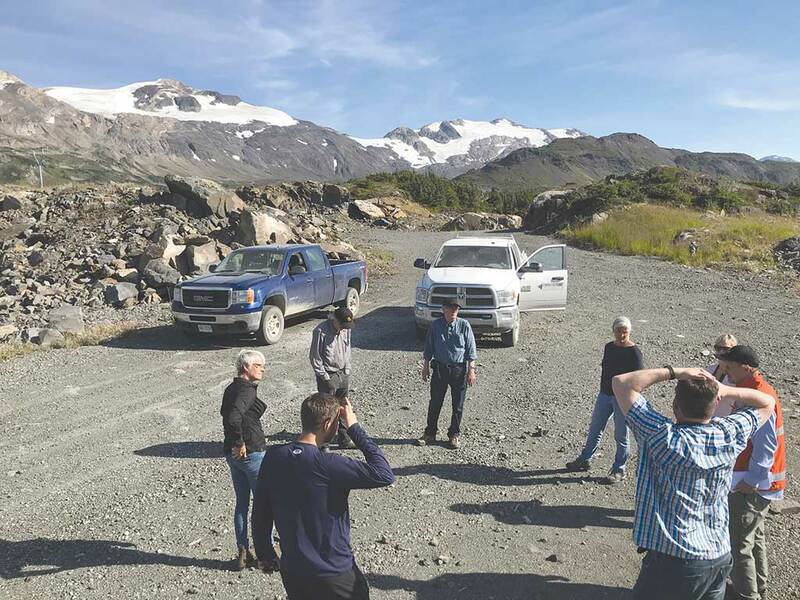 Ascot Resources CEO Derek White (wearing orange) gives a tour of the Big Missouri zone at the company’s Premier-Dilworth gold project in B.C.’s Golden Triangle region. Photo by Colin Desmond. Ascot says Westmin’s use of a Pro-Pulse Jig — an older gravity separation process vulnerable to inefficiencies, if not used properly — may have limited recovery rates. The company adds that metallurgical tests suggest modern gravity-separation techniques, such as a Knelson concentrator, could improve recoveries. Ascot’s plans to revive Westmin’s old infrastructure do not end with the mill. It has the option of tapping into the 31-megawatt Long Lake Hydro project — an upgraded version of the hydropower system used by the old Big Missouri mine. It plans to modify the Premier tailings dam, upgrade the old roads and refurbish the extensive underground workings at Premier and Big Missouri. But to get there, Ascot needs to define a high-grade resource estimate in the fourth quarter. The first of the three would be the Premier-Northern Lights area, which encompasses the old Premier mine site and underground workings. A May 2018 study pegged indicated resources at 1.2 million tonnes grading 7 grams gold per tonne and 30.6 grams silver per tonne for a contained 273,000 oz. gold and 1.2 million oz. silver, at a cut-off grade of 3.5 gold-equivalent grams per tonne. Ascot has focused on converting inferred resources to indicated resources, mostly by infill drilling the 609 zone in the Premier-Northern Lights area. Fifteen holes have been completed there, highlighted by 9.6 metres of 24.6 grams gold per tonne at 240 metres’ depth. Big Missouri and the nearby Martha Ellen and Dilworth deposits would make up the second mine. A 2014 study pegged resources for these three zones at 93.5 million tonnes grading 0.8 gram gold per tonne and 6.9 grams silver per tonne, for a contained 2.5 million oz. gold and 20.8 million oz. silver. Given Ascot’s focus on high-grade gold and recent exploration activity, the updated resource will likely look different. White says recent infill drilling has led them to believe high-grade mineralization is occurring in three intervals at Big Missouri: near surface, from 160 to 180 metres’ depth and at 300 metres’ depth. The company is waiting for drill results from over 100 holes in the area. Carbon-in-leach tanks in the old mill, built by Westmin Resources in 1989, at Ascot Resources’ Premier-Dilworth project. Photo by Colin Desmond. This leaves Ascot’s most recent purchase, the Silver Coin property, for the third mine. Ascot struck an agreement with Jayden Resources and Mountain Boy Minerals to acquire a 100% interest in Silver Coin on Aug. 13, meeting its goal of rebuilding Westmin’s old property portfolio. Silver Coin is next to the Big Missouri project and easily accessible from the Big Missouri haul road. It has underground infrastructure and side-hill access. A 2013 resource counted inferred resources of 967,000 tonnes grading 4.4 grams gold per tonne and 19 grams silver per tonne. Westmin mined 103,000 tonnes grading 9.3 grams gold per tonne from Silver Coin in the late 1990s. The deal still needs to be approved by Jayden Resources’ shareholders, which Ascot expects will happen in October. In the meantime, Ascot will conduct 2,000 metres of infill drilling on the property. This will keep it on track to incorporate Silver Coin into the updated resource estimate in the fourth quarter. White is optimistic about what the estimate will reveal. With the updated resource in hand, Ascot would publish a preliminary economic assessment shortly after. If all goes according to plan, it expects the mill will be up and running by early 2020. Ascot expects it would take capital expenses of up to $60 million to get to production, or a tenth of what White says is the average cost to build a mine in the Golden Triangle. The company has $15 million in the bank and a gravel-and-sand deposit it says can sell for $15 million. This leaves $30 million to get a mine at Premier-Dilworth up and running. It should be an eventful fourth quarter for one of B.C.’s most storied mines. In 1898, more than a century after British naval officer George Vancouver explored the area, a Seattle con man named Burgess circulated a story that he had discovered a placer field at the head of the Portland Canal as rich as those being found in the Klondike. He chartered the Discovery ship, sold berths to 68 men for $25 a piece and set off for Stewart from Seattle. A few days after arriving, he escaped on a native dugout canoe, leaving Stewart’s first settlers to fend for themselves. D.J. Rainey was one of three men who remained after the failed venture. He built a homestead and registered it with both the U.S. and Canadian government, unsure which side of the border he was on. Rainey then staked the area’s first lode mineral claims. He has been credited with discovering the Premier deposit, though Scotty Dilworth and the Buntin brothers staked the first claim in 1910. Premier lay mostly dormant until 1919, when a Washington engineer led construction of a tunnel on the property. Within a month, the miners struck high-grade gold. The Guggenheim family bought 52% of the project for $1 million and put the Premier gold mine into production. In the first two years, the ore averaged 120 grams gold per tonne and 4,000 grams silver per tonne. The mine sparked a second boom in Stewart and Hyder, both of which experienced a population exodus during World War I. The mine site had its own self-contained town with a doctor, hospital and even a swimming pool. The mine manager lived in a mansion with a Japanese garden. Ore was originally transported by horse sleighs, but heavy snowfall made it an arduous and inefficient process most of the year. An 18 km long tramline with 250 baskets hauling 360 kilograms of ore each was built to speed things up. The Premier mine produced 2 million oz. gold, 43 million oz. silver, 54 million lb. lead, 18 million lb. zinc, 4 million lb. copper and 178,000 lb. cadmium from 1919, until low metal prices forced its closure in 1952, making it one of the most productive mines in British Columbia’s history. It remained largely inactive until 1981, when Westmin Resources began diamond drilling on the historic site. At the time, Westmin was already two years into exploration activities at the historic Big Missouri mine, located 2.5 km north of Premier. Big Missouri was developed in 1927 by the Consolidated Mining and Smelting Co. of Canada (now part of Teck Resources). Like many other mines in the area, the reallocation of resources and manpower during World War II forced Big Missouri to end production in 1941. In 1989, Westmin built a 2,000-tonne-per-day mill to process ore from the two historic mines. Over the next seven years, it churned out 260,000 oz. gold and 5 million oz. silver from 3 million tonnes of ore. In 1996, the mill was mothballed. The late Stewart resident Ozzie Hutchings titled his 1978 local history book Stewart: the B.C.-Alaska Border Town That Wouldn’t Die. Certainly, the same can be said for the mine responsible for a large share of that history. Be the first to comment on "Site visit: Ascot looks to write Premier mine’s third chapter"